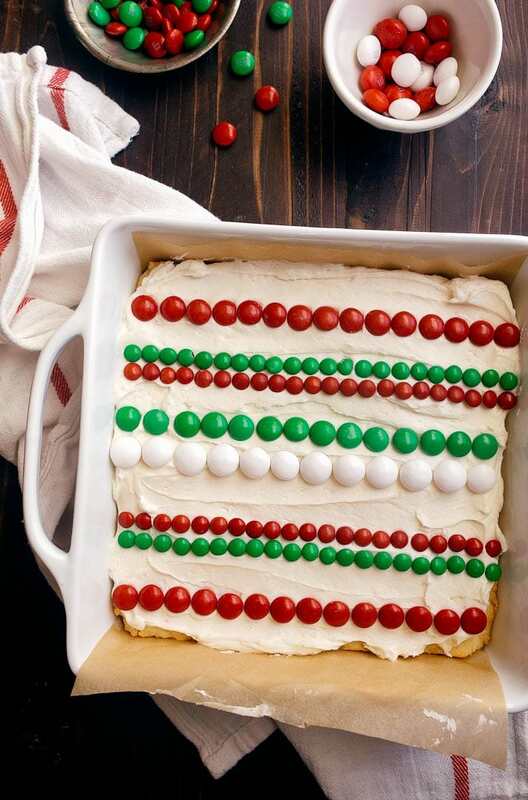 Christmas sugar cookie bars for Santa. 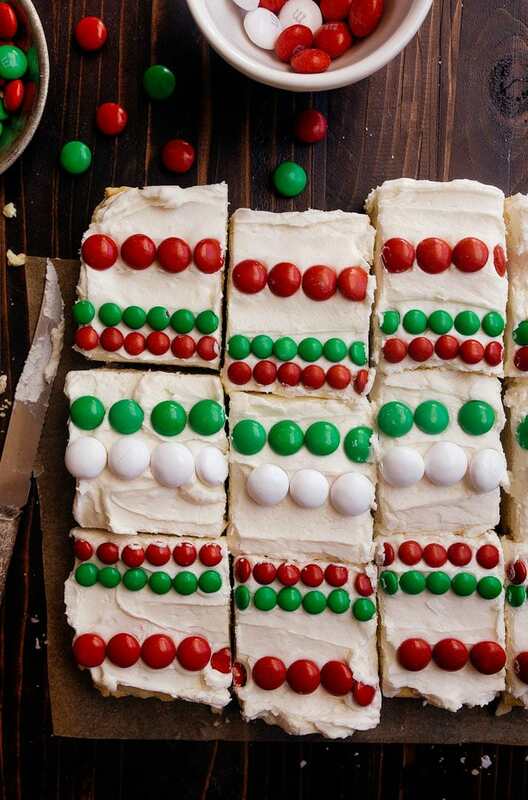 A small batch of sugar cookie bars made in an 8×8 pan and topped with cream cheese frosting and festive M&Ms. These Christmas sugar cookie bars are nothing new; they’re the same as my Valentine’s Day Sugar Cookie Bars, but with a Christmas twist. The video for this recipe shows the Valentine’s Day candy hearts–just sub in the Christmas M&Ms and everything else is the same! I decided to bring them back to the front and update them, because my Mom has been talking non-stop about how good they are since she made them in February. She said they’re the best sugar cookie bar recipe ever, and when your Mom gives one of your recipes a title like that, you take note. 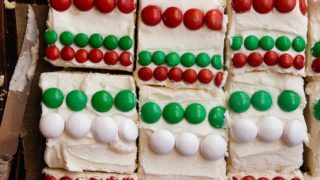 I had a Christmas sweater decor idea in mind when decorating these Christmas sugar cookie bars, and used a variety of M&Ms. This year, the purple bag of dark chocolate M&Ms are all green and red, so that’s what I used. Plus, the white chocolate peppermint M&Ms are over-sized white and red. This also feels like the appropriate time to brag that my toddler calls M&Ms ‘yem-a-nems.’ It’s the best thing ever. I told Camille we were practicing making cookies for Santa when we made these Christmas sugar cookie bars last week, but she did not like that idea. The problem is, she’s never been a big fan of Saint Nick. I have 3 years of screaming on Santa’s lap photos to prove it. She only agreed to continue making these cookies when I told her they were for Santa’s reindeer. Always an animal lover, that kid of mine. So, make these for Santa or his reindeer, it’s up to you. I also want to point out that baking sugar cookie bars in an 8×8″ pan is loads easier than making individual cookies if you’re in a bit of a time crunch on Christmas Eve when baking for Santa. Plus, small-batch cookies are always the best way to go when baking with kids. 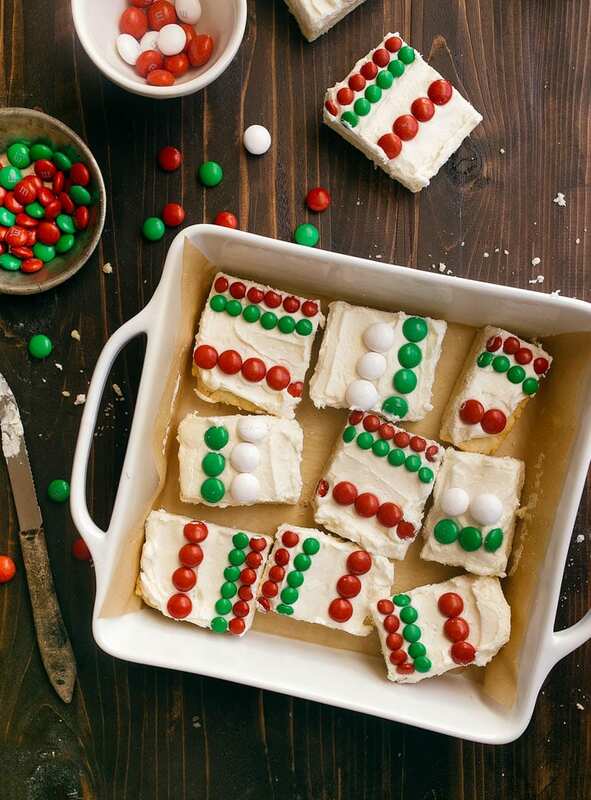 Christmas Sugar Cookie Bars for Santa. Oh, and these look delicious too!!! I never should have looked at this. All my fave ingredients, and the frosting kinds of hangs over the edge. Now I better get out of the recliner and see if I have the items. These look interesting. Do you mean we should buy the cream cheese that is already whipped or should I buy a block of cream cheese and whip my own? Yes, I’m wondering the same thing! Should I buy the whipped cream cheese? Or buy regular cream cheese and whip it myself? We’ve got a lot of goodies lined up to make, but we might have to have some of these too because they look so good! Are these soft sugar cookies or the crunchy type? These look amazing! I have to bake Christmas cookies in quantity for my sons’ Teachers, our neighbors, friends, etc. but I love cookies with frosting more than any other cookie so this is perfect for just me! On the off chance the whole tray isn’t eaten right away, how do you store them? Fridge?